Washing clothes only when you have a full load. Avoid doing several loads in one day. 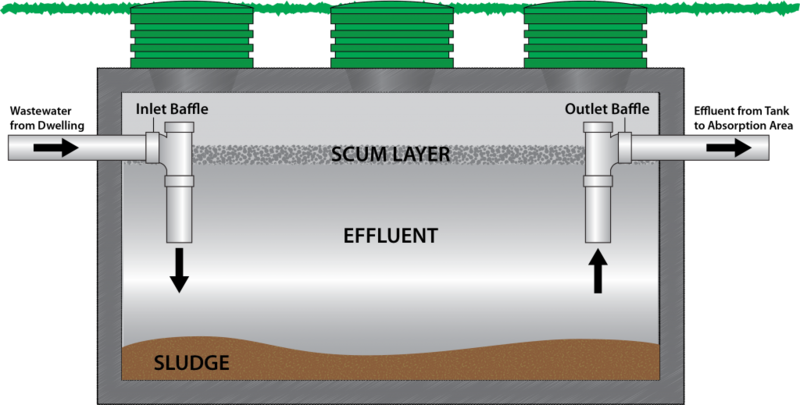 The septic system design includes the average use of the clothes washer (definition of average use–three to four loads per week). Take short showers instead of baths. Don’t turn the shower on all the way and turn off the water while lathering. Install a water-saving device in the shower system. Use a water-saving device in your toilet tank and don’t flush unnecessarily. Don’t let water run while washing teeth, hands, vegetables, dishes, etc. Use a stoppered basin. Many other ways of conserving water exist. Use water-saving devices where feasible. Be alert and institute other water-saving ideas. Minimize or avoid using the garbage disposal unit. Remove scraps with the garbage or properly compost them. Collect grease in a container near the sink rather than pouring it down the drain. Minimize the discharge of paper products. Non-degradable items, such as disposable diapers, sanitary napkins, Kleenex, kitty litter and paper towels are especially harmful. Use a good quality approved toilet tissue that breaks up easily when wet. Basically three products should go into the septic tank: human wastes, toilet paper, and water from toilets, bathing fixtures, kitchen sinks and laundry washers. Ordinary use of household chemicals will not affect the bacteria in your system if not used in excessive amounts. Do not use your tank to get rid of oils, paints, insecticides or other poisonous liquids. Do not plant large trees over the absorption system. Small feeder roots will enter the drain holes of the leachfield drain lines and form a mat within the drain line. This mat blocks the flow in the level drain line rendering the remainder of the line unusable. Large roots may displace the drain line. As a general rule, large trees must be as distant as possible from any trenches. Trees with a trunk diameter of nine inches should be at least ten feet distance from any trenches. Ideally the leachline/bed systems should be left in uncovered open sunny areas so as to be provided maximum evaporation. This is an important factor in these systems, but not applicable to seepage pits or dry wells. Do not allow rain water or drainage water to pond over the leachfield. Maximum saturation and temporary failure may occur until the pending dissipates. Do not construct walkways, patios, swimming pools, permanent structures or parking lots, over or within the leachline/bed areas. This would prevent maximum evaporation, may cause damage to the system and may cause a premature failure. Before purchasing a house, you should request a “Septic Certification”. A licensed septic tank contractor can perform this service and will verify in writing of the condition of the septic system. Your tank should be routinely pumped at least every three years or once a year if a commercial establishment.